I mentioned the other day I’m having a hard time getting (and staying) in ketosis, and also that my vision is going bad – and fast. I did some brief research and determined that the culprit was my new Lexapro prescription. My weight has been the exact same for 5 days in a row. Why?! I hear this complaint/comment/question all the time. We discussed it awhile back in this post: Mysterious Weight Gain & Stalls. Gains or stalls can be caused by any number of things: medications, hormone cycles, food culprits, etc. Intense workouts or muscle strain can cause what seem like a “weight loss stall” as well, during the muscle recovery period. And of course if you’re doing intense exercise or strength training on a regular basis, you’ll want to do body measurements and use a full body composition scale. I didn’t exercise in the beginning, by the way. Plus if you’re just starting out or just got back on track, the first week you drop a lot of water weight during the diuretic process of getting in ketosis – then your body has to take some time to adjust. That’s exactly what I’m doing, while lowering my dosage on the Lexapro strategically until I can get in to see my doctor about that. But yeah, I found out the hard way that “carb cycling” doesn’t work. That’s how I stayed fat for so long 😛 lol. Powering through the “stalls” or “holds” and keeping my carbs low and my macros right is how I finally got lean & fit! 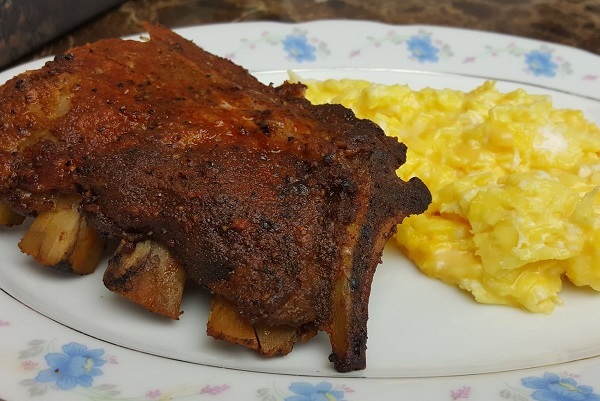 For breakfast (which was actually closer to lunchtime, lol) I had leftover smoked pork ribs with no sauce and 3 eggs scrambled in real butter with colby jack cheese. That was a delicious combo! The ribs were super tender and fell right off the bone. YUM. My lunch… was a mountain of low carb love!!! 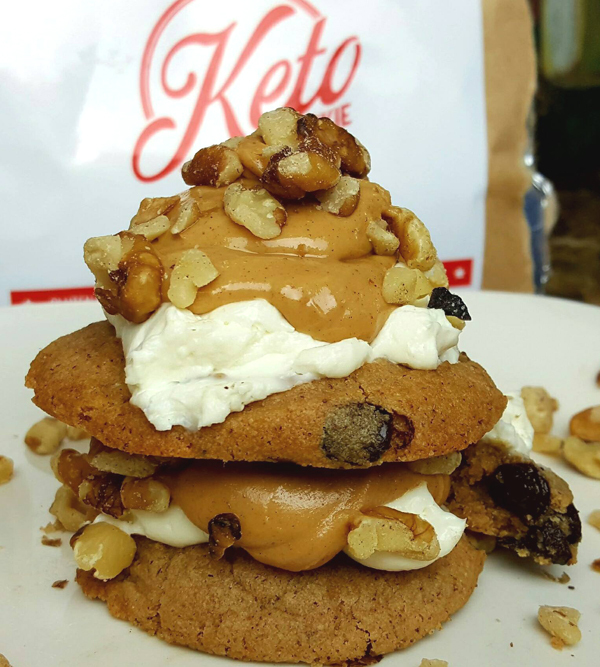 Have you tried Keto Kookies yet?! They’re sugar free, gluten free low carb cookies – and buttery delicious!! The chocolate chip are only 3 net carbs for 2 cookies. 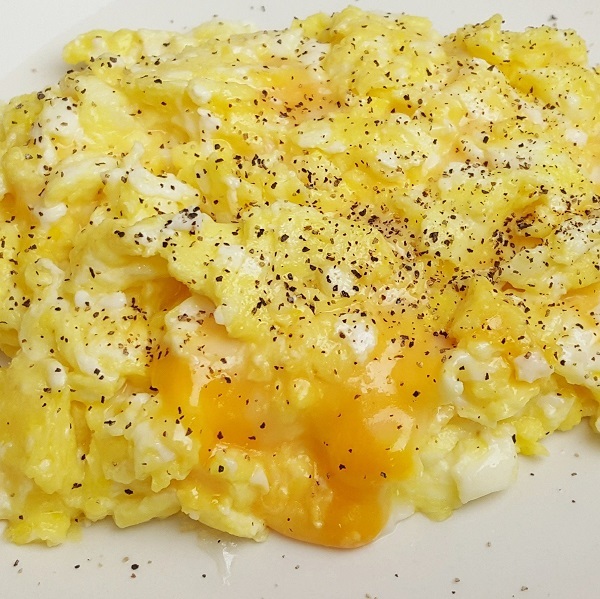 For dinner I whipped up 3 eggs scrambled in real butter with colby jack cheese… and sprinkled with black pepper. 🙂 Simple! My low carb breakfast yesterday was a great combination of healthy foods. 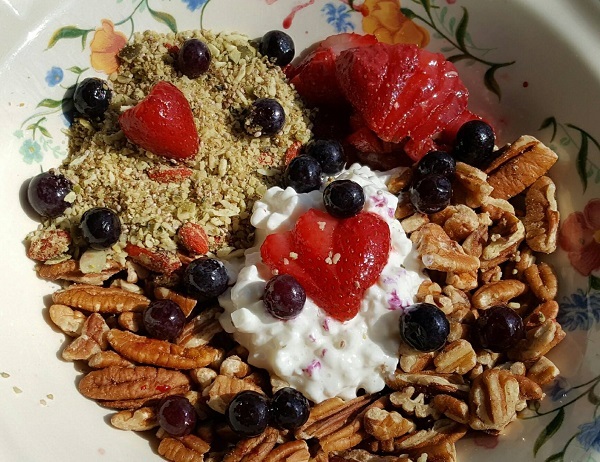 It’s 1/2 cup pecans, 1/4 cup Daisy brand cottage cheese, 4 small strawberries, 17.5 grams of blueberries + 3 tbsp of Coconut Gogi: a nutrient dense super food, rich in omega 3. 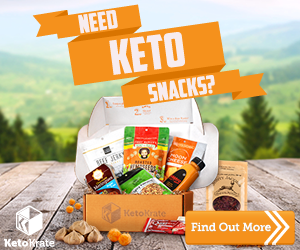 I got that in my last Keto Krate box and I’ve really been enjoying it! 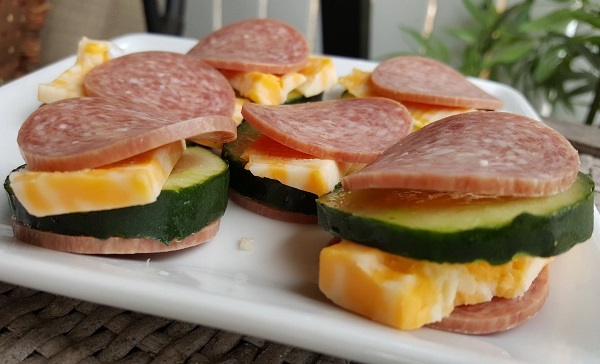 My low carb lunch, I called Salami Sammies. 🙂 It’s Kretschmar salami slices with colby jack cheese & crisp cucumber slices… dipped in ranch. Fun & easy! Did I mention they’re handmade?! Do you have a weight loss journal or goal planner that you use to stay motivated and track your progress?? This is the planner I use: InnerGuide Life & Goals Planner. In addition to lowering my dose on the Lexapro and weaning off of that, I’m ready to start getting back into serious strength training and muscle building. Sometimes you have to set something up even, like a get together with friends 3 weeks out. Having something to work toward (for a real reason!) always motivates me to GET and STAY on track. So let’s all put something on our calendar!! 😉 What do you say? I also need a good tan again for all these cute Spring outfits & dresses I ordered. Dang, I feel like my body rewinded an entire year on me, lol. Sheesh! 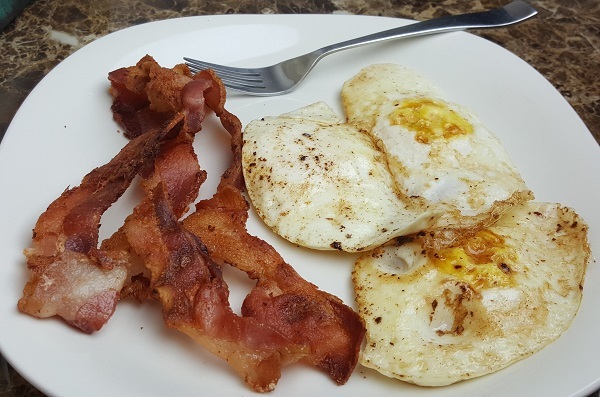 This entry was posted in Low Carb Daily Journals, Weight Loss. Bookmark the permalink. I always enjoy your post. Thank you for keeping me motivated. I am up and down on the scale just because I keep giving in. Wearing shorts is just around the corner. 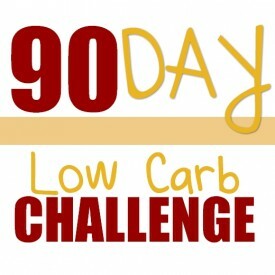 I hope that gets me to stay with my lchf wol. What do you feel makes you “give in” – what’s the source behind that? That’s what helped me post when I was bouncing on/off – getting to the source, identifying the triggers, etc. Kudos, Michelle – that’s awesome!! 🙂 WAY TO GO!! That 140 mark was the hardest for me to break through, lol. Congrats!! Spring/summer seems to get me motivated since clothing is so light. Just wish I didn’t do this yo yo with the scale my entire life. You have kept me trying every day and I thank you for keep on keeping on with your post. And when I say commit, I mean to sometimes weeks on end of the scales not moving – no excuses. Just eat for my health. That’s what finally worked for me, and I was SO proud of myself! That feels GOOD. You are such an inspiration. I am doing just what you are saying. This is week 8 and I am so frustrated I’ve only lost like 15 pounds. I have not cheated once but on some emotional days I do overeat. I have far more control and dedication than I have in years past but I feel like this will take forever. I am 48 and need to lose nearly a hundred pounds. Just keep going? I do exercise twice a week and stand on my feet as a mom of three and do deep medical massage. I also track now on my fitness pal. Thanks for your encouragement. If you want to lose weight faster try cutting out any bars/shakes and processed foods first. Next, try cutting out/down on: cheese, cream cheese, nuts. Hi Lyn. As a former nurse, i do know that most antidepressants can cause weight gain. Ask your Dr. For an alternate med perhaps. There are antidepressants that do not seem to have an impact on weight gain and may work just as well as Lexapro. Also i realised that i must be goung through Keto flu. I always forget the symptoms of it that make me feel so lousy for a day or too once i get in ketosis. I felt so weak yesterday….i had a headache and just felt sick. I had no energy. Then i realised what was going on. I wonder what other symptoms others experience when going thru this keto flu. And what they do to get through this. The best solution to both Keto Flu and cravings/hunger is a hot mug of chicken broth. 🙂 It replaces the sodium & electrolytes lost during the diuretic process of getting into ketosis. I like Campbell’s condensed broth like you cook with, mixed with about half water instead of 1:1 – and a pat of butter makes it even richer. Best hot out of a mug! I am down 15 lbs and 11 inches (bust to hips) in 56 days! No hunger but lots night leg cramps and light-headedness. I upped my magnesium, salt, and potassium intake a LOT and it helps immediately. 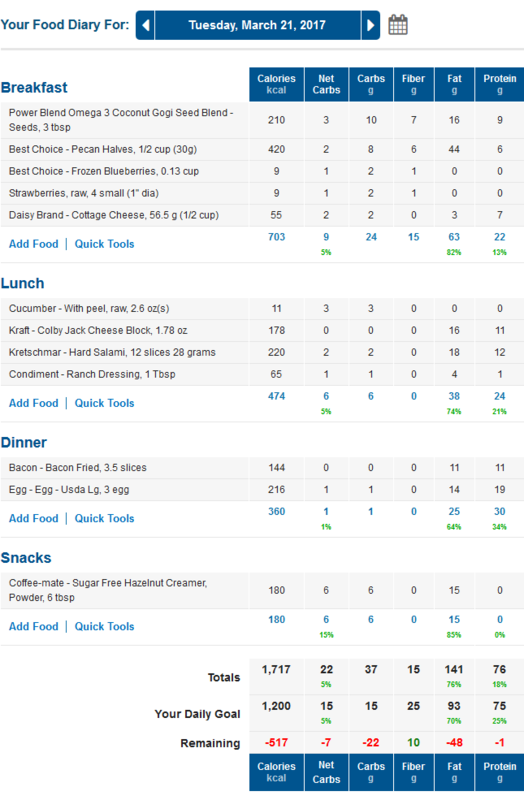 I wanted to lose 15lbs and did and now I am trying for another 3-5 lbs then need to maintain. 5’4″ at 130 lbs now age 61 female. I was never heavy before *aging* this is certainly the answer for me. In times past I had a HUGE appetite and overate coupled with TV watching/night eating. Now I drink warm chicken broth (1/2 c plus water with 1/2 Tbl butter sometimes) and maybe 2 Tbl high fat nuts while watching TV with the hubby and I am totally satiated. Amazing! I look forward to your posts, your ups-&-downs with transparency, and your Southern humor! I work from home too so getting my steps inb y using my FitBit is the key for me. I go for 8,000 steps, 5+ flights stairs, and 20_ “active minutes”. Way to go, Sheila!! 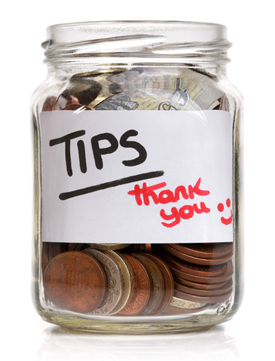 And thank you for sharing those helpful tips. 🙂 The chicken broth is GREAT for helping with those cramps too – as it replaces sodium & electrolytes lost in the diuretic state of ketosis. I came across your blog several weeks ago and love the ideas you put in it, especially meal ideas. I even signed up for the Keto Krate last month too. I started really focusing on low carb eating the first week in February and I was really discouraged with my weight loss. You can read eveywhere on the web how lowering your carbs makes the weight just fall off….that is not true for all of us! But my blood sugar levels have improved so much I got a congratulations letter from my doctor after my last bloodwork came back with such great results. This is what has kept me going and guess what….as of March 23, 2017 I have lost 14 pounds. So sticking with it will let your body (finally) get the message to start using that extra fat for energy!! 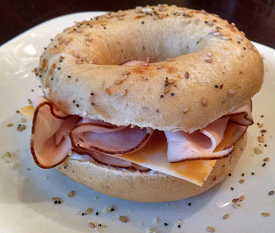 Thank you Elizabeth – I’m glad you enjoy it here, and you’ll LOVE the Keto Krate. 🙂 Losing 14 pounds in a little over a month is GREAT weight loss! I’m not sure why you’re discouraged?? That plus the healthy improvements are such positive and FAST results. 🙂 Kudos!! I’ve been on Lexapro for 4 years and my doctor just upped my dose to lessen my perimenopausal hot flashes (I’m 47). I hope it doesn’t have an impact on my weight! I’ve been low carb since January of last year. When I started Lexapro, I noticed I was binge eating more often. It’s under much better control now that I watch my carbs although sometimes I go crazy with the pecans when I’m stressed. In any case, this way of eating definitely keeps me from binge eating on much worse foods. Question: have you noticed ANY change in your vision since you started Lexapro four years ago?? Did it take you a full month to get into ketosis?? I found that drinking alkaline water and pure coconut water helped me feel better from keto flu. Has anyone here used Tahini in recipes. I bought a container of it. I love the flavor of sesame seeds and its oil. It is a super healthy low carb food. I found recipes for sauces and baked chicken dishes on line using Tahini but have not used any yet. Does anyone have any good lc recipes using Tahini? I haven’t heard of it, but that sounds interesting! 🙂 I look forward to hearing what you try, and recommend! Hi – I have been following you for 2 or 3 years now. I love your honesty and how you just put yourself out there with all the good and bad things that happen in life. I just have to wonder if you have integrated too much processed foods into your way of eating? Just a thought I would throw out there because it has happened to me and I had to get back to the basics. You inspire me! 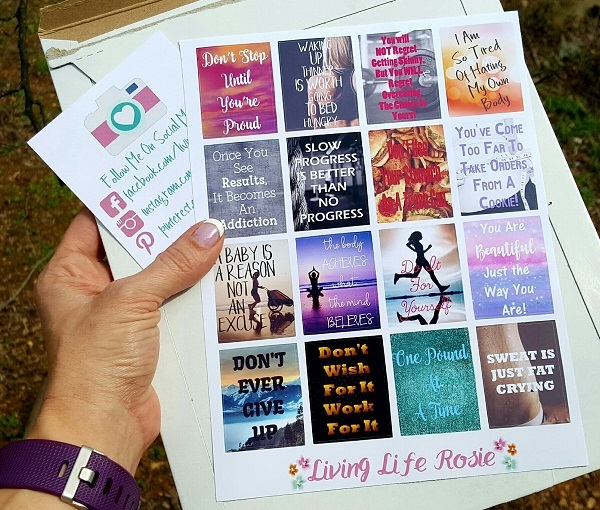 That plus getting back in awesome shape – those are my Spring goals! I’ve been doing the LCHF thing for about two months, while also attending bootcamp 3x and doing 300 minutes of cardio weekly (motivation comes from my upcoming nuptials). Side bar I’ve been doing the gym thing for about 6 months. My immediate weight loss was 10 pounds – like boom and hasn’t really moved since then. My body composition is changing – noticeably; hive five! However, before LCHF, I didn’t eat a lot of dairy (cheese), now it’s a daily or twice or ok, three times a day thing – and I’ve broken out in a gross acne/rash me. I’m guessing I have a food allergy – and that’s 1) making me look like a pepperoni pizza and 2) stalling my weight loss. I’m sure I can find more online; but I trust your judgement in regards to tasty recipes, as all that I have made that are yours – are tasty! Can you feature more ‘non dairy’ recipes? Hi Kimberly & welcome! 🙂 Your opening comment made me laugh, and smile – lol. 🙂 🙂 Congrats on your engagement!! Two things. First, it’s very common to experience a brief “hold” on the scales after your initial weight loss. That’s just your body adjusting to losing 10 pounds so fast. So just keep doing what’s obviously working for you! It sounds like you may have the “keto rash.” Google it and see. What kind of dairy are you eating, btw – cheeses? Omg. Yep that’s it keto rash. And I do workout a lot so that explains it! There doesn’t seem to be a ‘cure’ other than to get out of keto, which I did yesterday (cake tasting for the wedding!). Any recommendations? I eat mostly cheddar cheese with the occasional double glouster in the mix. In addition, I make a tasty cabbage and hamburger casserole that also has sour cream and a bit of cream cheese in it. That’s been a staple for me. I was getting cramps while working out and the extra boost of potassium from the cabbage (as well as supplements) really helped me out. Chicken Broth will help too. The cramps are because ketosis is a natural diuretic state, so you need to replenish the sodium & electrolytes lost. I’ve never had keto rash, though it IS fairly common, so I would just do some research on that. From what I understand it doesn’t last very long? I’ve been doing LCHF for 3 months now and have lost 12 pounds without much exercise. Recently, I had my bloodwork done and, to my surprise, it was elevated. My LDL was way above the guidelines. HDL was spot on. My total number climbing 30 points since my annual check up from July. Anyone else have a similar situation? I think that’s common in the beginning, John. BUT, if you hadn’t had your numbers run since last July – it’s possible your numbers were up BEFORE you started eating LCHF just 90 days ago, and that they’re actually improving. I like your “KISS” meals … simple is the way to go. And I like the fact that you keep it real, too. I appreciate everything you do to keep the group going and informed and interesting. I haven’t lost a pound this week, but I know it’s not a true stall … probably just my body readjusting to the 52# I’ve lost thus far. I’m not worried because I’m staying at or under 20 net carbs. I have a LONG way to go and I’m damn sure not giving up because the scale hasn’t moved this week. It will continue to move at it’s own pace and I will continue to lose at my pace. That’s a GREAT attitude, Cynthia – and CONGRATS on losing more than 50 pounds already! 🙂 Wow… Kudos!! Hi, Lynn! I click over here from Tumblr, so thanks for posting your links there. I was wondering how strict you were about your macros when you were initially losing your weight. I see here that you’re over your calorie, fat, and protein goals one day and over your calorie and fat goals the other. Do you find that these don’t matter as much for you as long as you stick to about 20 net carbs? Was that always the case, or were you more strict in the beginning? 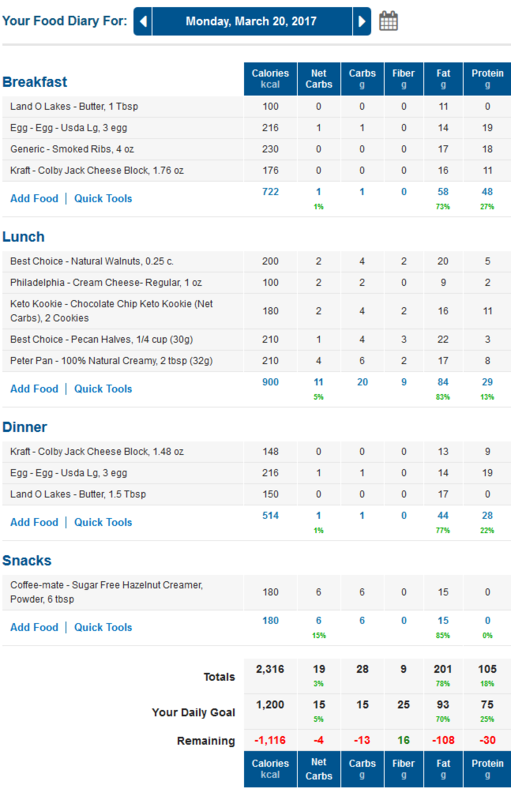 I keep it really simple, and have from the start: 20 net carbs max, 70% fat minimum – those are my goals, and the ONLY thing I pay attention too. I ignore goals, calories, etc. You can’t go by grams anyway, because some proteins are also fats. See: http://www.travelinglowcarb.com/7006/macronutrients/ for a simple explanation & illustration. How interesting! Thanks for sharing. I’ve been really worrying about protein and making sure I’m eating fewer than 90g because of the “ideal” macros I got from a keto calculator, but I wasn’t actually sure that protein matters. I have noooooo problem getting my fats, but there are days when I’ve supposedly run out of protein and am just like, “What am I supposed to do, eat mayonnaise for dinner?” Seems like I need to do some testing and see if I can eat more protein and still lose weight like you have. Thanks again! lol that made me laugh! haha 🙂 The only thing about protein is to stay at or under 25% of your total calories – but that usually takes care of itself if you are eating 70% fat and 20 net carbs. So I rarely even have to look at it. Just stumbled upon your page today. Love it. Finding lots of good advice and help. I have been doing low carb since January 12 pounds down saw several things here that may have been my problems. Staying in ketosis has been a problem for me. I saw here that bread can cause a stall. I did cut bread out last week and I’m back in good ketosis. So I’m glad to be making these connections. I also ordered food and used your link and will continue to do so. Thanks for all you do here and I have only scratched the surface here. Welcome Tricia 🙂 It’s nice to meet you! and Thank you!! Kudos for taking control of your health, and congrats on your weight loss so far. 🙂 It’s a learning process for sure. It was for me too. If you ever have any questions, don’t hesitate to ask! Low carb is the only thing that works for me. Problem I have is not knowing or getting to a maintenance level. I lost over 70 pounds lasted for a second. I still have size 10 with tags on. But I’m on it again excited to have found your page I think this will help and encourage me alot! I do have a question for you why don’t you drink protein shakes? I work morning shift and don’t take the time to make breakfast so I do a shake and a Atkins snack bar. Wondering if this could be another of my staying in ketosis problems? Great question, Tricia! I do find they tend to stall me or slow down my weight loss AND if I have them on hand I just eat/drink them until they’re gone, lol. Ok I guess I will eliminate them and see what happens. Thank you for your quick response!